Just Jerky makes Australia’s finest quality beef jerky. Selected from premium Australian beef, we take pride in crafting irresistible flavours using the best hand-picked gourmet ingredients available. 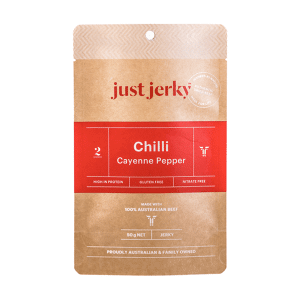 Just Jerky is available throughout Australia. Get yours on our online shop, or in-store at selected supermarkets, grocers and bottle stores. We believe Australians should have access to quality, healthy snack foods. With two pack sizes and three delicious flavours, our beef jerky is perfect for your next adventure. Australians love our quality, healthy and whole food jerky snack to fuel their daily adventures. The search for adventure lives in all of us. We love to seek out the next big thing; an exciting experience to cherish, share and remember. Our innate passion for adventure is what drives us to challenge all obstacles. So, it’s no wonder that Just Jerky’s Australian beef jerky has become the ultimate trusted adventure snack for so many explorers, just like you. Whether your next adventure is an action-packed thriller or a casual day-trip drive, trust in Just Jerky to give you the added fuel you need to adventure for longer. 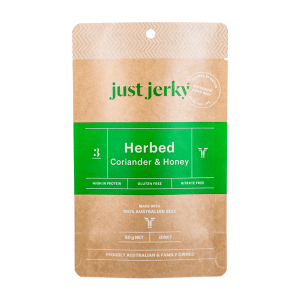 Just Jerky’s delicious flavours and conveniently sized packs are perfect for those on-the-go, wanting a high-protein snack to keep sustained and healthy. Share your next adventure with us on our Facebook or Instagram using #justjerky. Get Australia's finest quality beef jerky today and enjoy the complete whole food benefits of Just Jerky. You can taste it, see it and feel it. The taste of better defines Just Jerky. It’s a mantra for doing things better, while striving to make Australia’s Finest Quality Beef Jerky. We only use 100% local Australian beef. Each and every ingredient is hand-picked from the finest ingredients available, ensuring our beef jerky is the best quality - all the time. This finest quality approach means Just Jerky is simply delicious, giving your taste buds a flavour-filled kick. And don’t forget our beef jerky offers essential minerals and vitamins, with the naturally occurring super protein giving you added strength to sustain you throughout the day. You can buy our beef jerky using our quick and easy shopping cart. 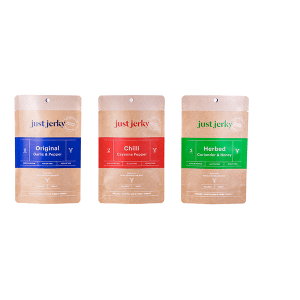 Select from your favourite assortment of pack sizes and flavours and get Just Jerky shipped straight to your door. 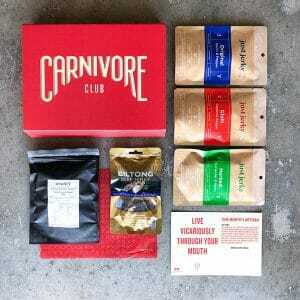 It’s never been so easy to buy beef jerky online. If you prefer to shop at your local supermarket, grocer, bottle store or health food shop, then you can look for Just Jerky on our stockist list here. If your local store isn’t stocking our delicious beef jerky yet, let us know so that we can bring you the finest quality beef jerky. Remember to keep connected. Stay in the know for exclusive competitions, giveaways and information. Lets make a deal. Connect with us, right here and now, and we’ll share the love in return with a little something something. Keep up with the play on delicious recipes and cool Just Jerky competitions and giveaways. Just Jerky’s made for sharing. Open up a pack with your mates then share the moment with us. 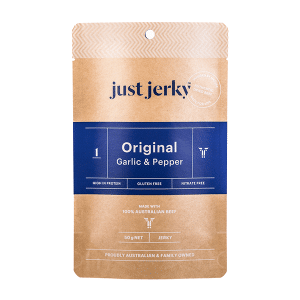 Use #justjerky and tag us when you open your next pack.